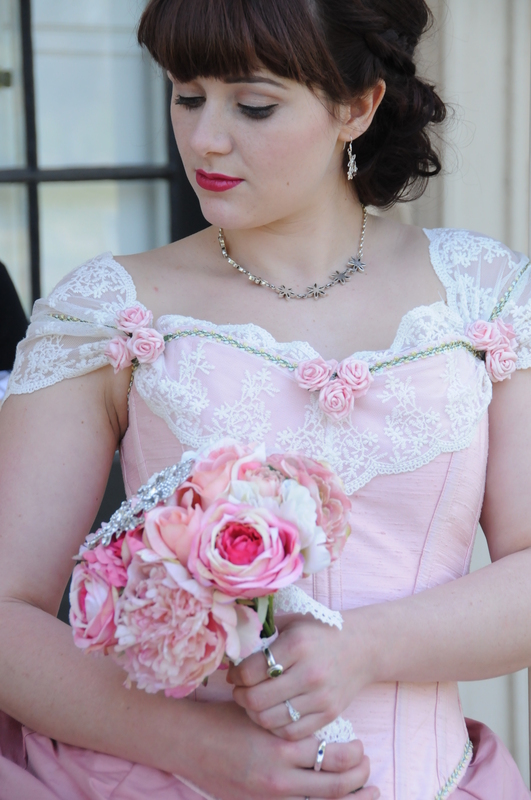 Spring bride collection part 1 – the dresses……. And so it is done! 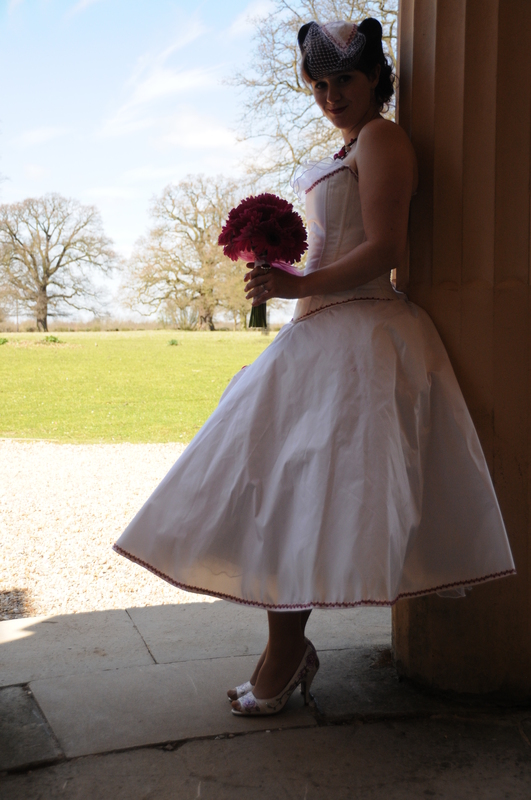 The collection is finished and photographed and as we are awaiting the professional pictures, I thought I would post some technical information about the frocks themselves – fabrics used, pricing, etc. this post is illustratedwith the pictures taken on the day by my hunband, Lucas, the proper images and a blog about the day of the photoshoot with all credits etc, will be posted in a few weeks time! The theme: Spring, flowers, pinks, greens and whites, all freshness. Price bracket – this design can be rendered in any colour and almost any fabric with labour prices starting from £800 for a bespoke item. 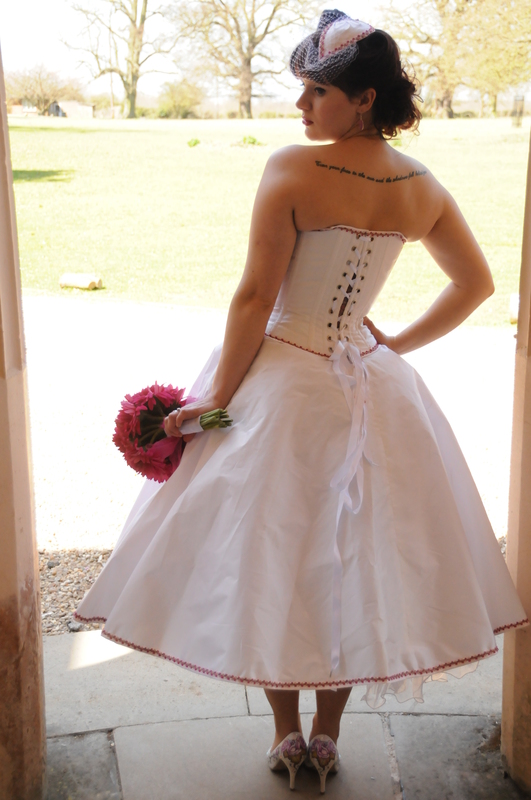 A 50ties inspired gown consisting of a corset in silk taffeta and an assymetrically draped circle skirt in silk taffeta (James Hare, 5m), worn on a net petticoat and a funky flounced petticoat, the corset and the skirt are decorated with a pink trim. 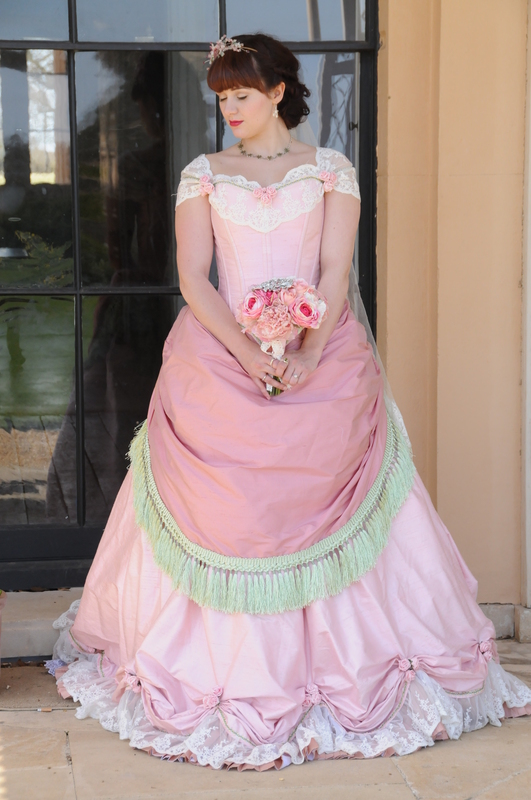 A Victorian inspired ensemble: corset and skirts in silk duponi (2 shades, altogether 15m used) lined with organdy and silk, with braid ( 10m), lace( 15m), fringe (4m) and flower decoration. 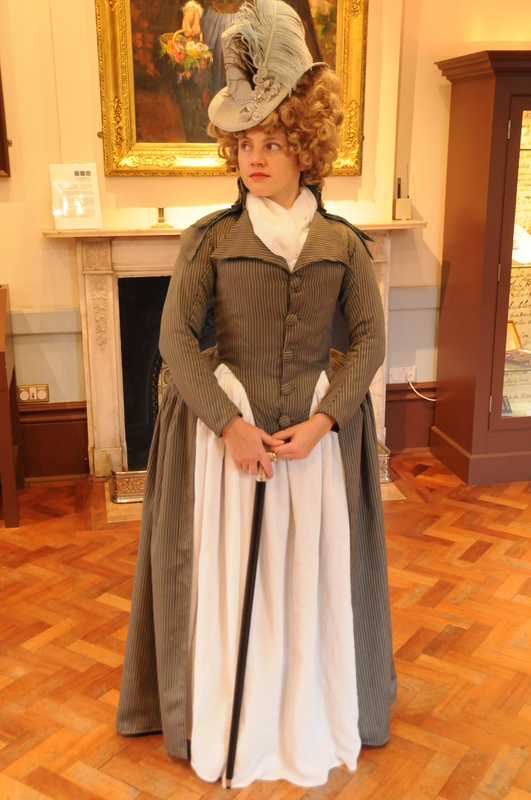 the skirts can be worn with or without the apron fronted overdress. 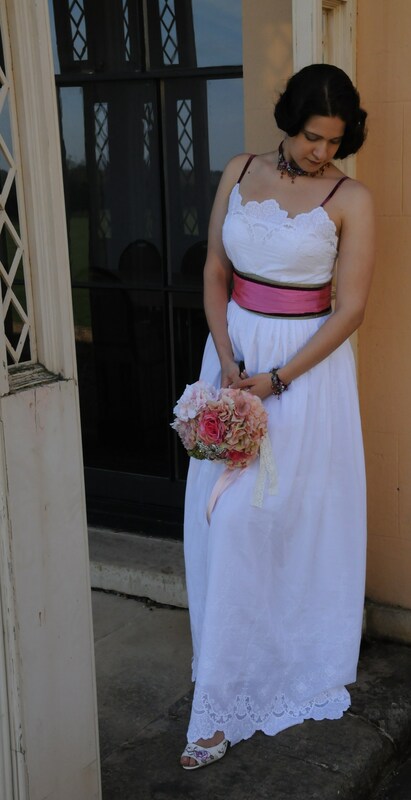 A simple and graceful dress in white embroidered cotton (4m), with a silk sash. Inspired by the 20ties and Downton Abbey series, this dress is perfect for brides favouring freedom of movement and natural lines – ideal for boho and destination weddings! A Rustic Tuscany vineyard look, can be rendered in many colours and many different trims. labour prices starting from £900. 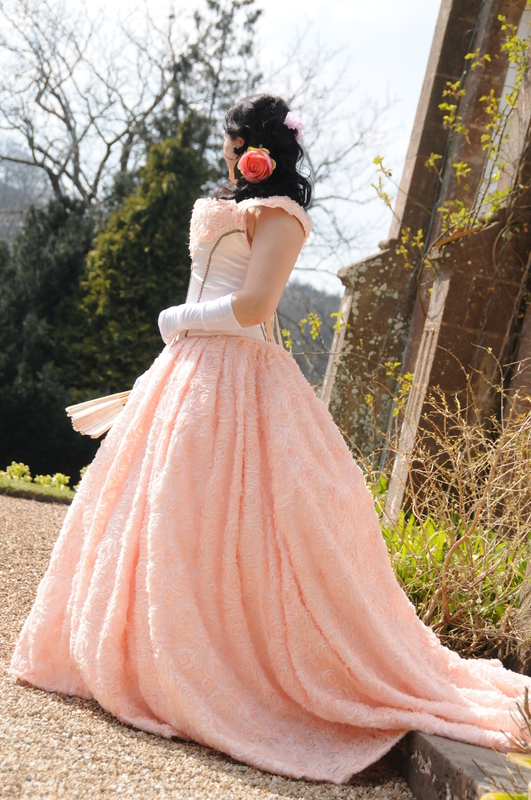 some of the dresses may be offered on sale as samples, please do enquire! And that’s it in part 1 – in part two we will no doubt drool over Paul Mockford professional photos: I will also provide a full list of all the suppliers involved in the shoot – so stand by! New Year’s Eve is always a good excuse for a party, and since our carefully prepared plans to go and spend ours in the Carpatians, skiing and snowbording, fell through due to various injuries, we needed a back up plan. 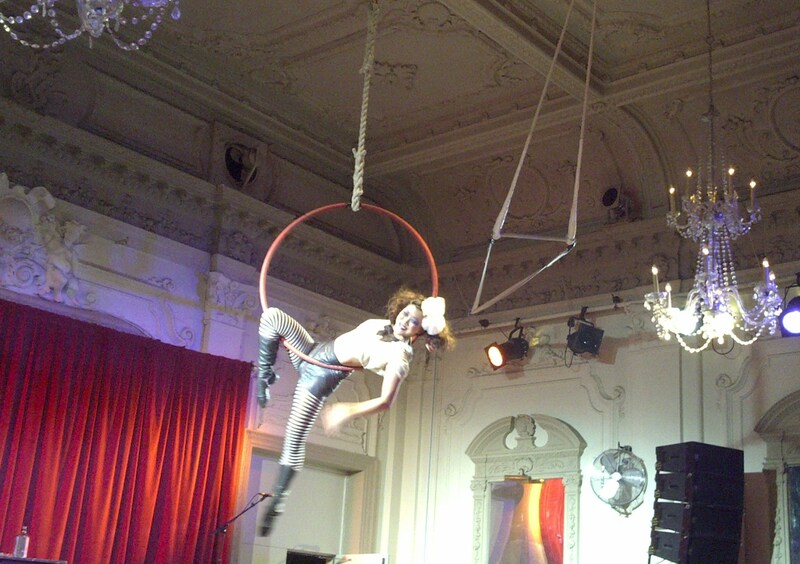 Fortunately, merely a week after I transferred out skiing holiday to my parents, White Mischief announced their New Year Extravaganza – ideal! We attended Tobias’ event before: we went over to see a Stempunk concert he organized in Scala in October – featuring one of my favourite bands, Abney Park. 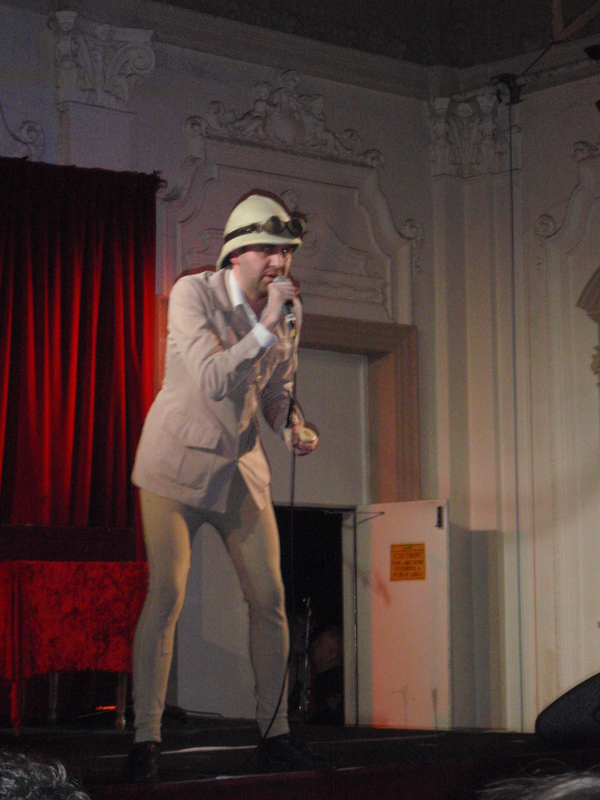 We were both impressed by the quality of the gig, so we had no doubts this one would be just as good. 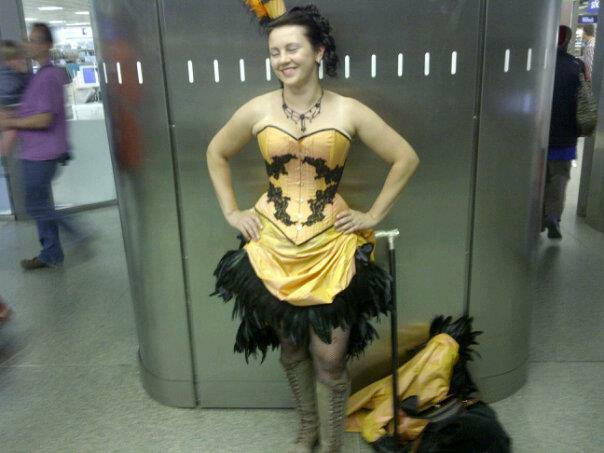 on the way to the Abney Park concert, here just after being laced in in the corset – in the middle of St. Pancras station…. And so the train tickets were booked, the hotel sorted out for the night ( thanks to BA Airmiles we stayed in Marrior not too far from the venue 🙂 ), and all we need to do was to sort out our attire for the night. 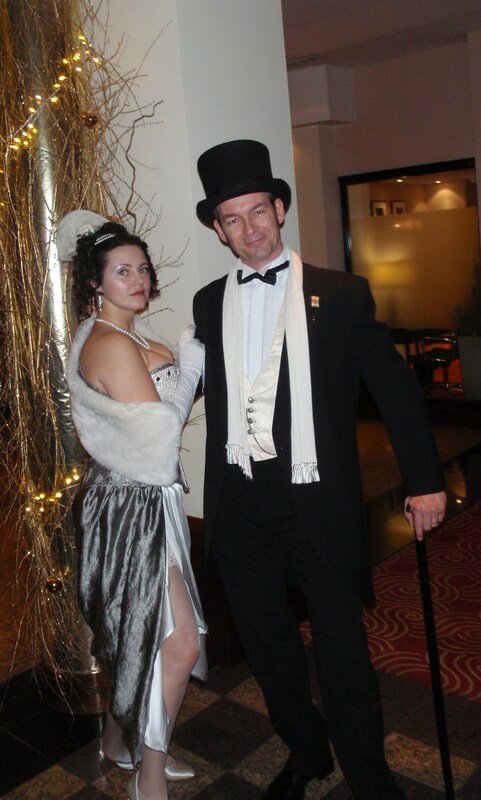 The theme was Steampunk, cabaret, burlesque, Victoriana etc – so a lot of choice! 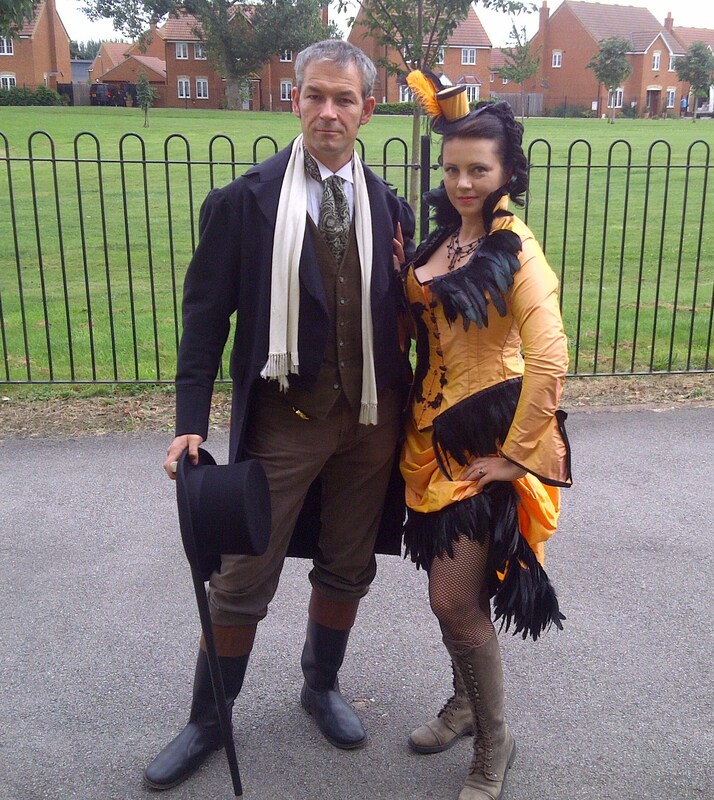 In the end, Lucas decided on a Victorian Vigilante style, an elegant dandy in a topper and with a walking stick, and I went for a more eclectic corset/skirt combo. 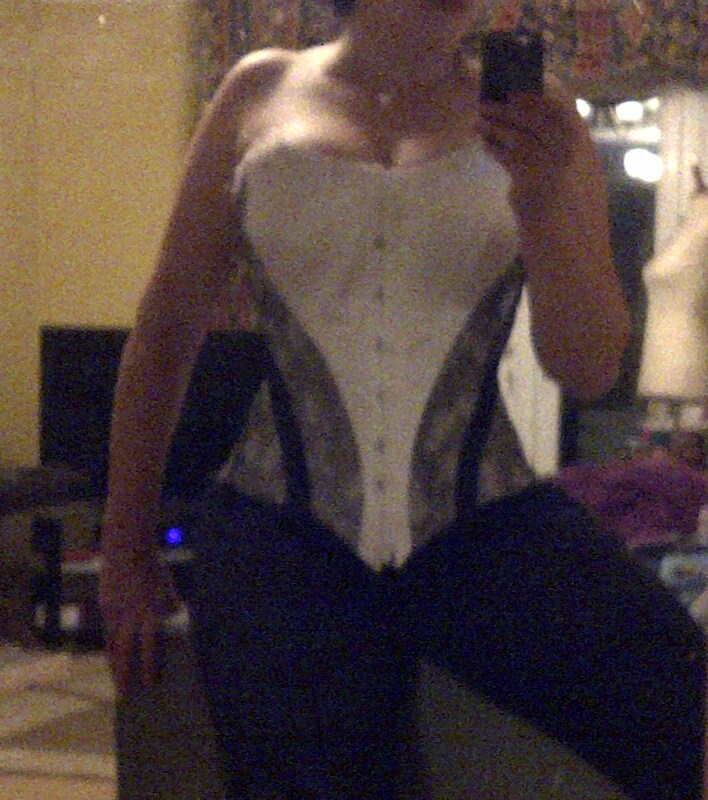 lovely corset made by Julia! 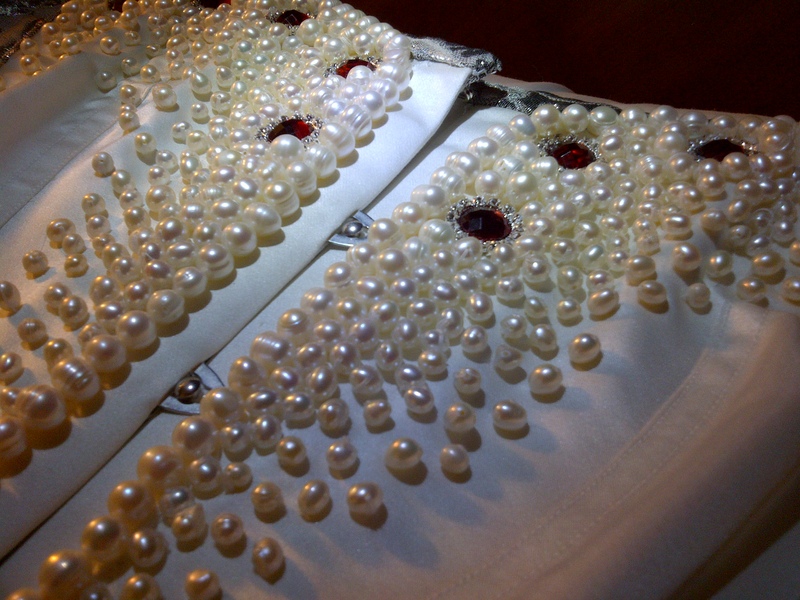 Julia was generous enough to give me the copy of the pattern, so I planned to adapt it, making sure its modern version is a proper overbust, and to make it in white and black satin, silver tissue and lots of bling on it . 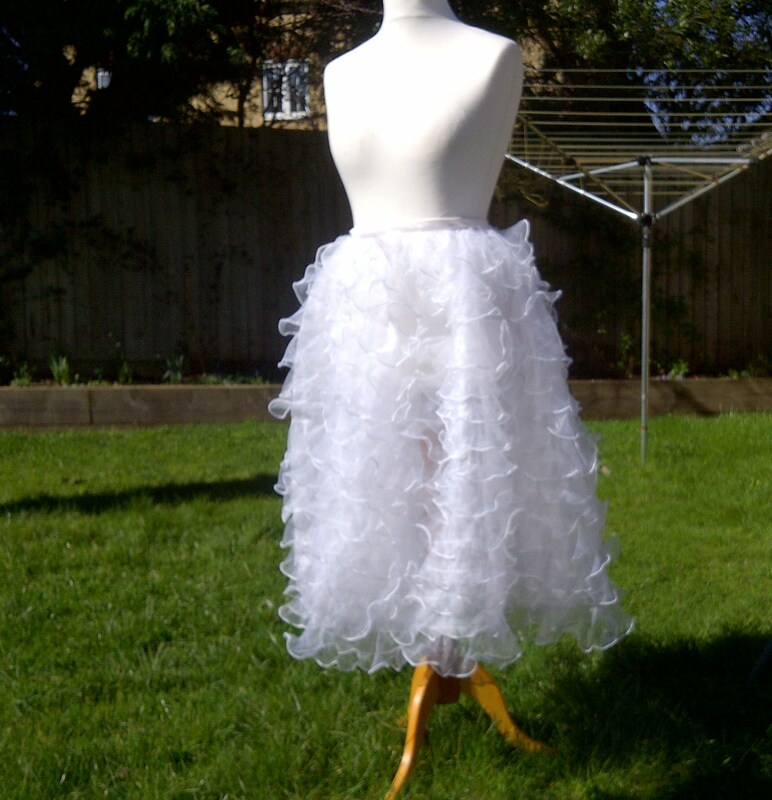 The first stage was redrafting the pattern and making a mock up. 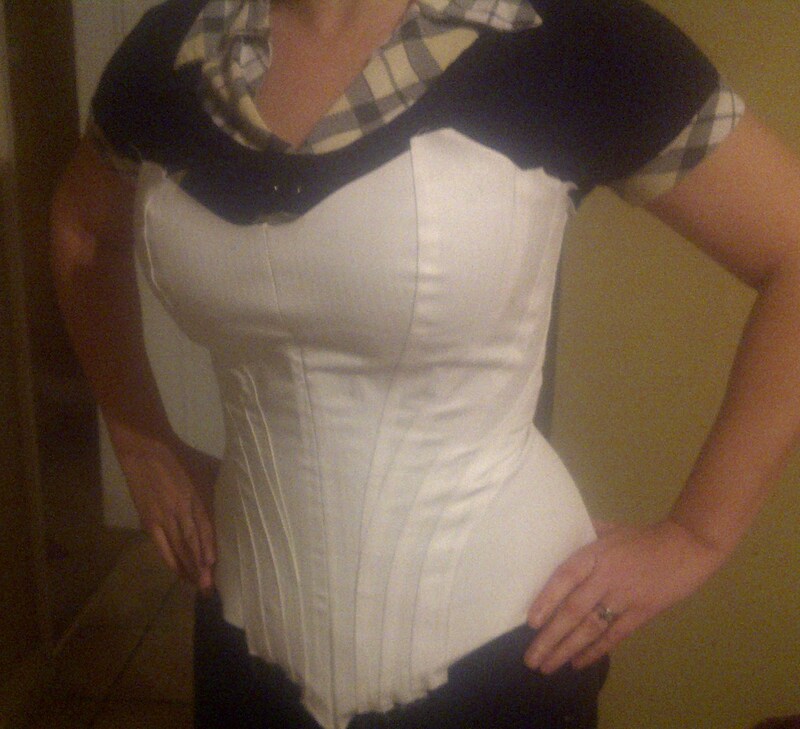 A bit tricky, but armed with both experience and with Julia’s corsetmaking dvd book, I managed the task, getting a comfortably fitted toile. all that remained was to make the thing in the proper fabric ( even more tricky as the silver tissue proved to be stretchy…. On the day, we made sure we were well fed ( Nandos! ) and made our way, in pournign rain to the venu at Sheperd’s Bush. The place was heaving but we made a wise provision of booking a table – and soon our friends, Heather and Matthew joined us. The event itself – well the entertaiment was great! 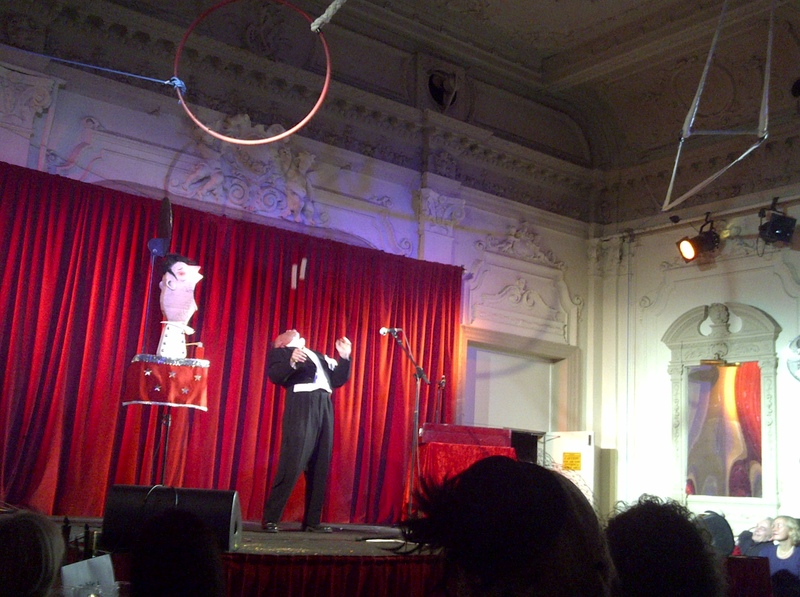 the compere was provided by Professor Elemental ( another favourite performer of ours) and all the other artists: trapeze performers, singers, dancers etc were exceptional. 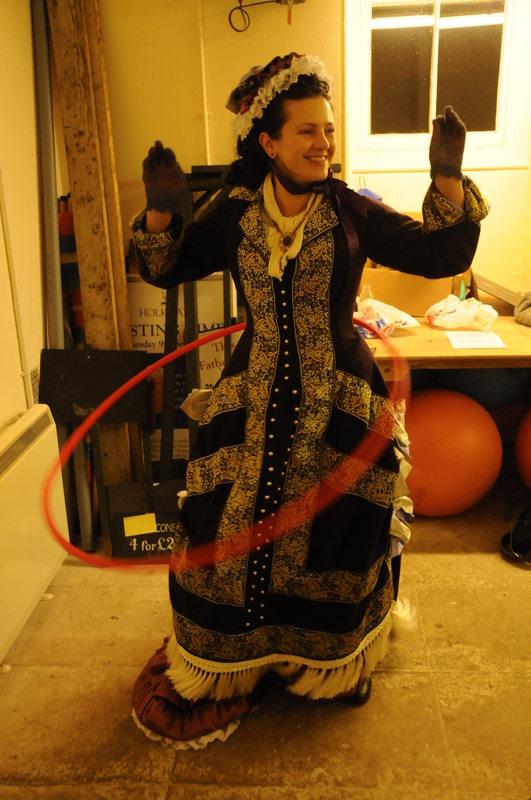 a thoroughly enjoyable evening was had by all – and a few pictures froom the night below! stunning act by this incredible girl! and a rather bizzare act of a man to did amazing things with ping pong balls. 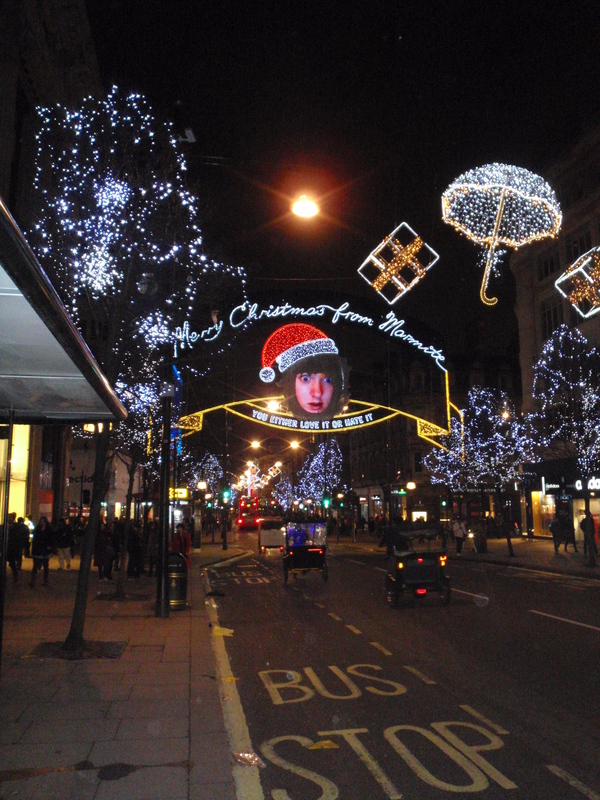 On the way back we strolled through the centre of London – very nicely lit! 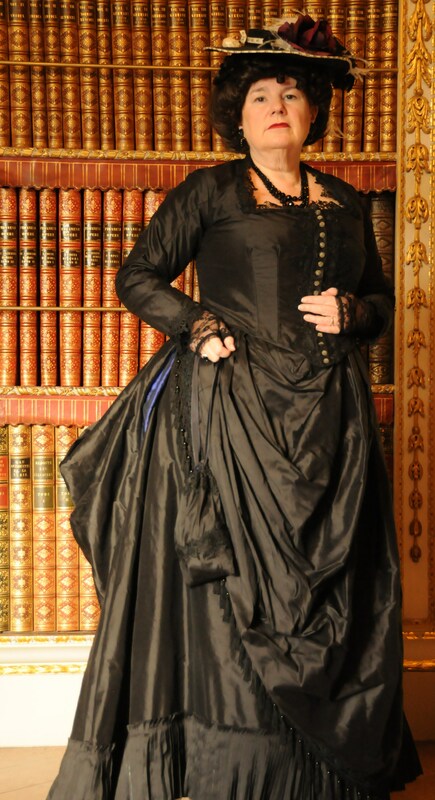 going for the seductive look here…. 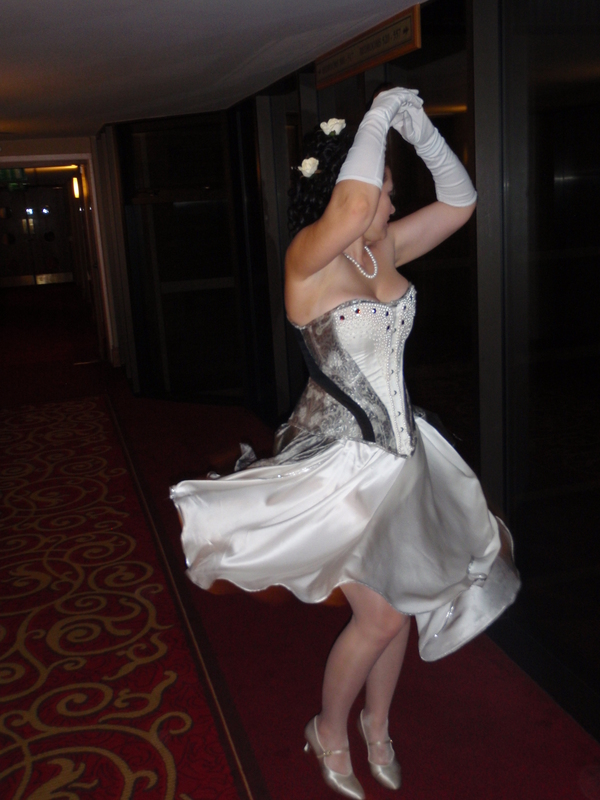 and having some fun dancing in the corridors…. 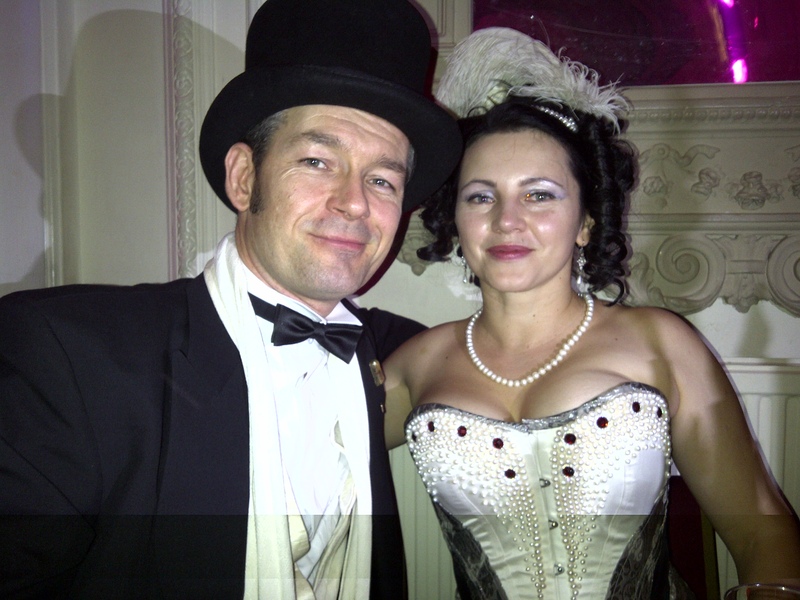 Altogerher – a lovely party, happy with the outfit ( might wear it for our Spectacular ball again…) – so Thank you White Mischief! 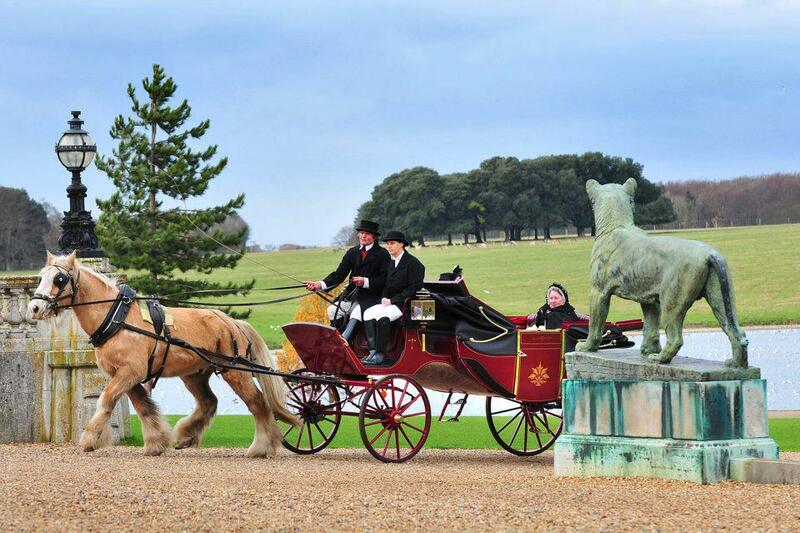 For the last two years we were lucky enough to be working at Holkham Hall during their spectacular Christmas events – again organized by Black Knight Historical . The venue, located on Norfolk coast, nearby a lovely beach is simply stupendous – indeed it has been used in a few film productions ( The Duchess was, I believe, one of the most recent ones). The Coke family still lives there and it is a real privilage to be able to work in such lavish environment – our favoirite room was the South Dining Room. The room set up for Christmas dinner. 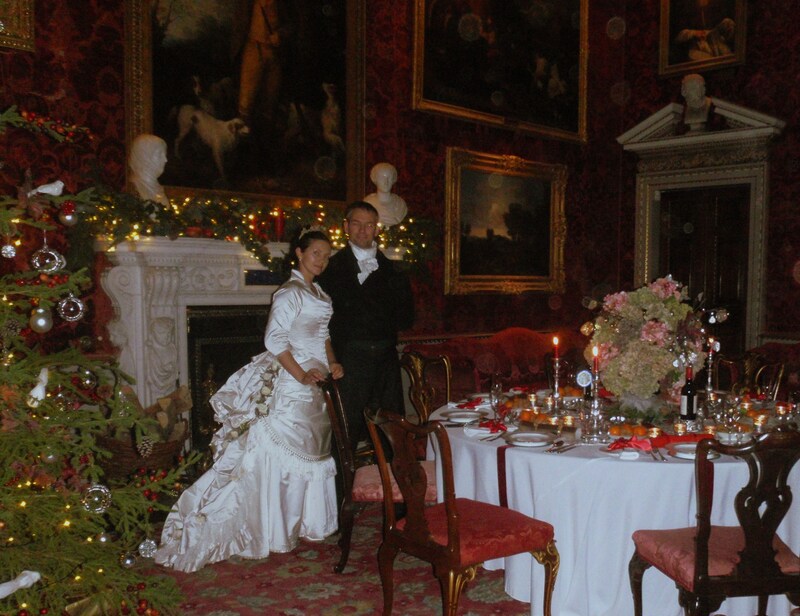 In the 2011 we spent a weekend there – and since it was just a few months after our Victorian Wedding, we assumed roles of a newly wed couple on their visiting round. 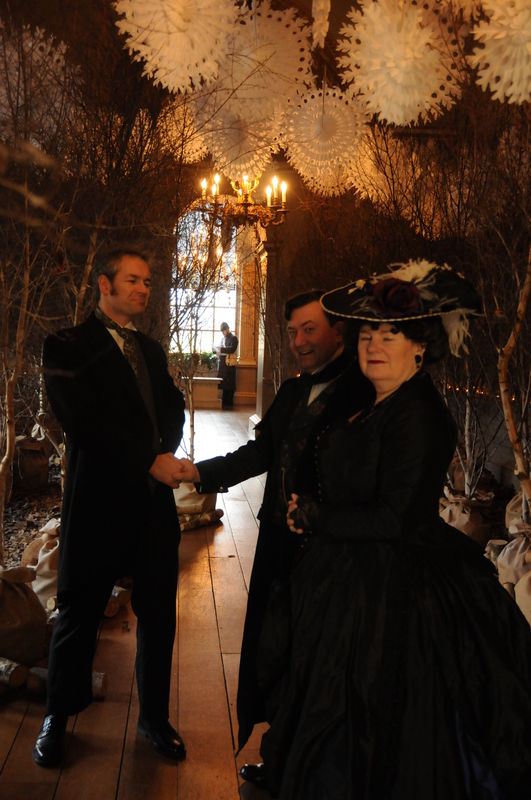 Our task was to interact with the visitors, chatting about Victorian wedding customs, fashions and dances. 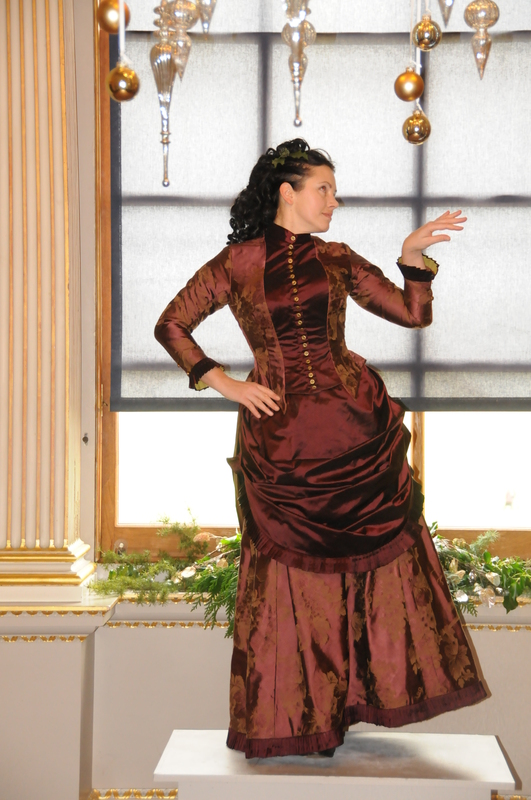 We were also scheduled to do a short public talk about Victorian dances and do a Vienesse waltz demonstration. 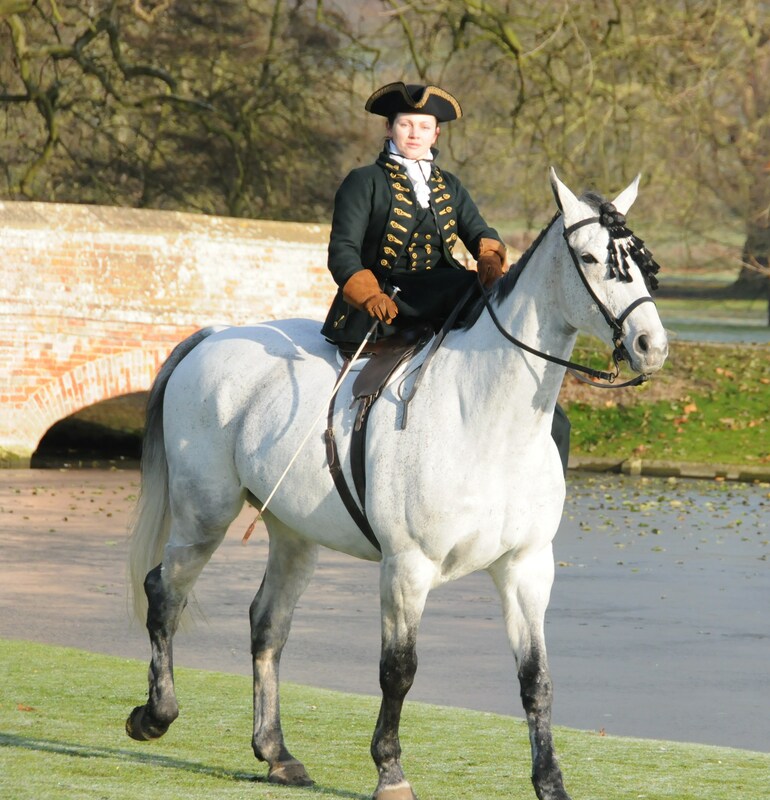 There were lots of interesting things happening around the venue: the kitchens were busy preparing festive food ( lovely stuff by 4and20 Blackbirds), and at noon Her Majesty Queen Victoria ( eve from Live’n History ) arrived in style. 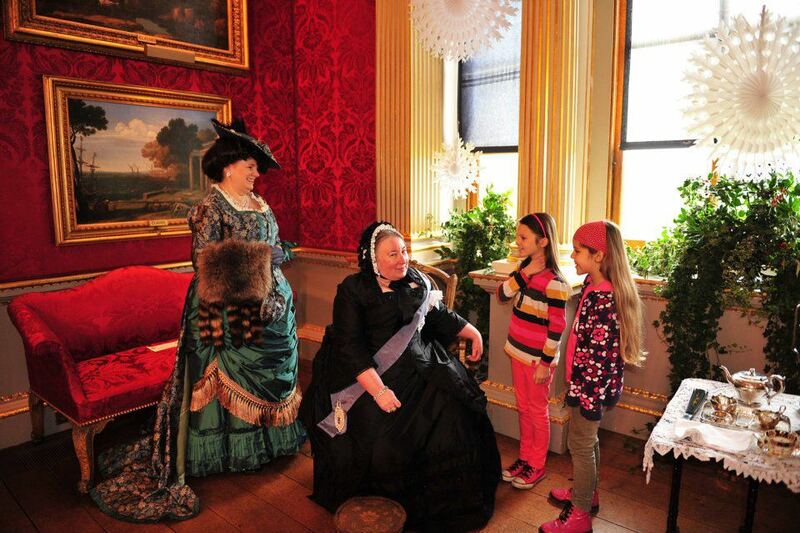 The Queen had a good look around the Hall, and then sat down to tea – and to spend some time chatting with the children. Her Majesty, Eleanor as the MIstress of the Robes and two brave girls asking for a position at court no doubt! Altogether two very busy days, in great company and fantastic surroundings. So when we were approached to participate in the 2012 event, for two weekends, we did not hesitate! 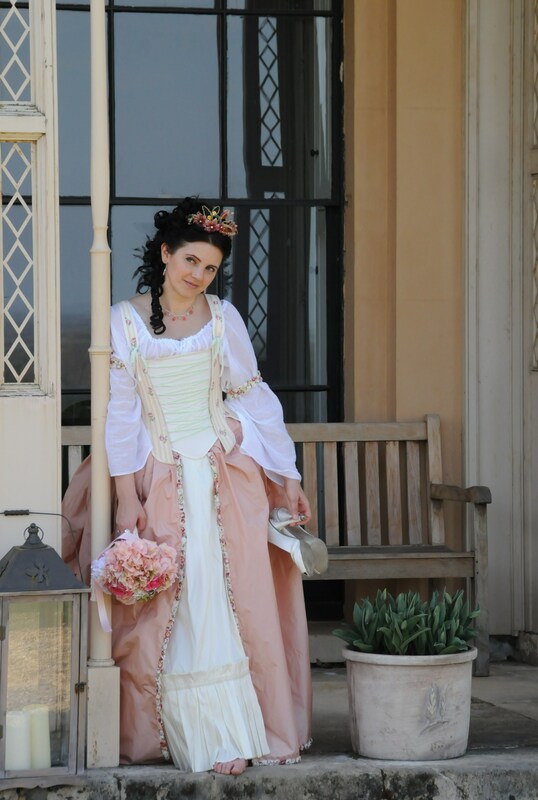 One thing was clear – I needed more frocks! 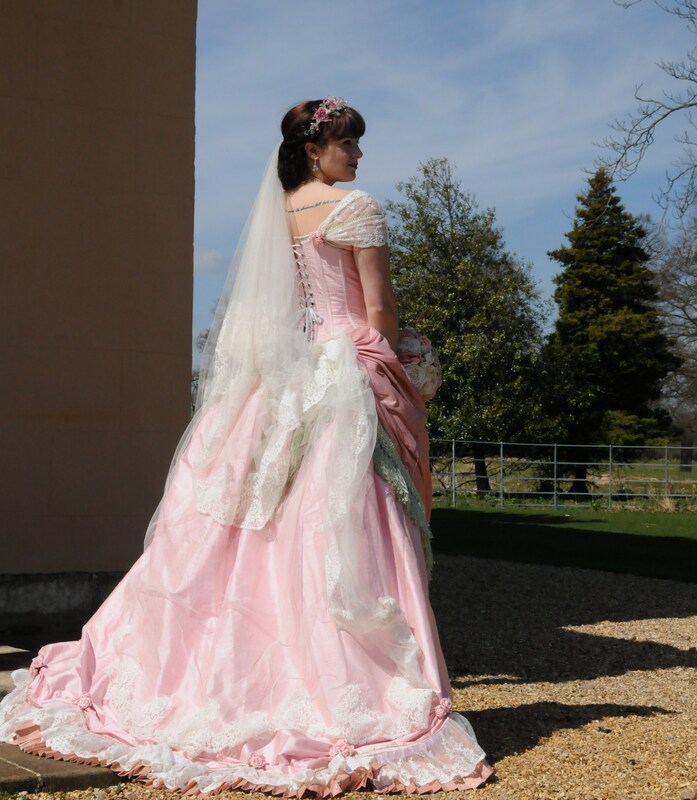 My wedding gown, worn already on several occassions needed a rest – and I now had a perfect excuse to make some new Victorian outfits! 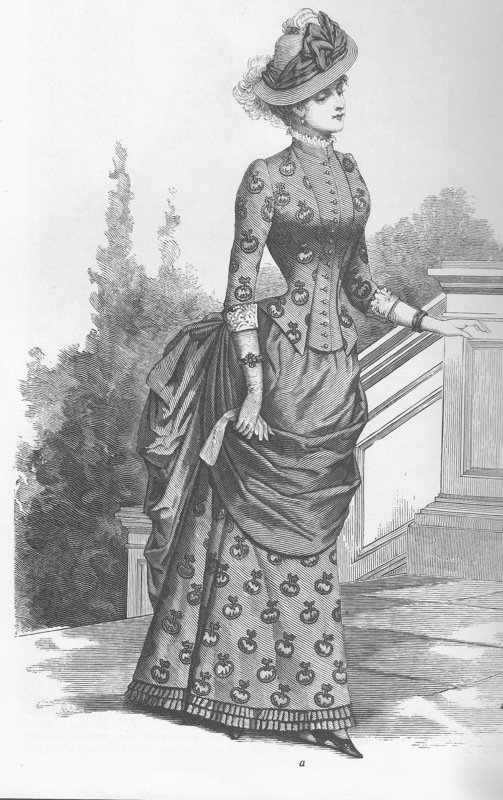 I have decided to wear my 1885 Riding habit on one day, and make a warm 1877 polonaise and a walking dress for the other days. 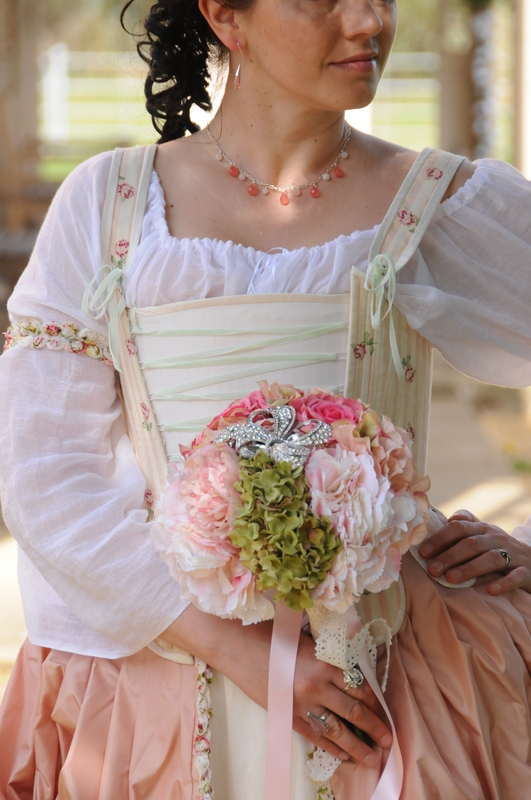 The polonaise was based on a fashion plate from Harpers Bazar and I made once before – for one of my bridesmaids. this time i wanted to make one in wool, with decorative border. 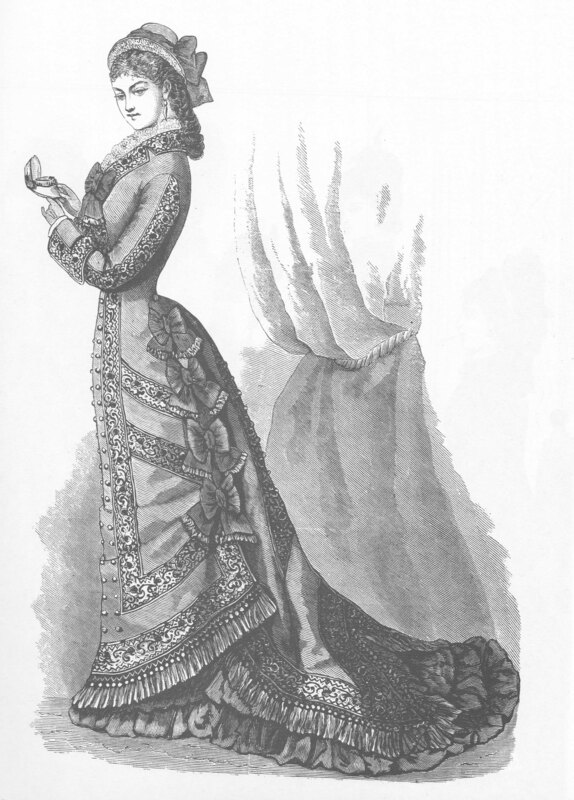 the other outfit was also based on a fashion plate from the same book. This time the whole of the house was open and the decor was absolutely amazing. 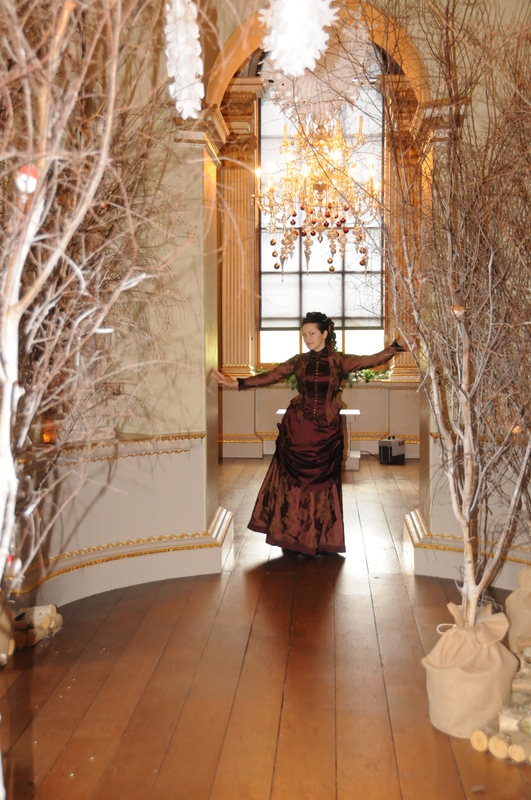 the rooms were transformed – and one corridor was made into a lovely winter’s paradise, complete with moving animals! 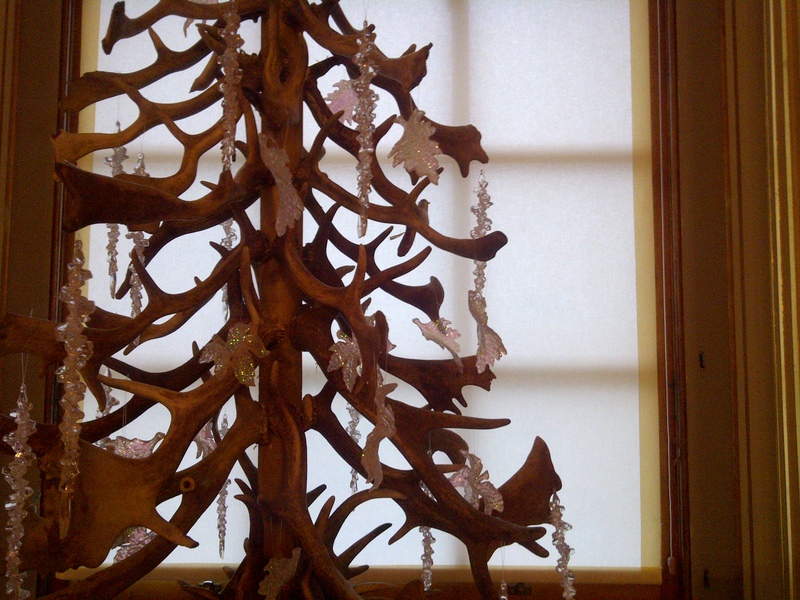 There was a different Christmas tree in every room – my favourite was the one made from the antlers shed by the stags from the local deer park. 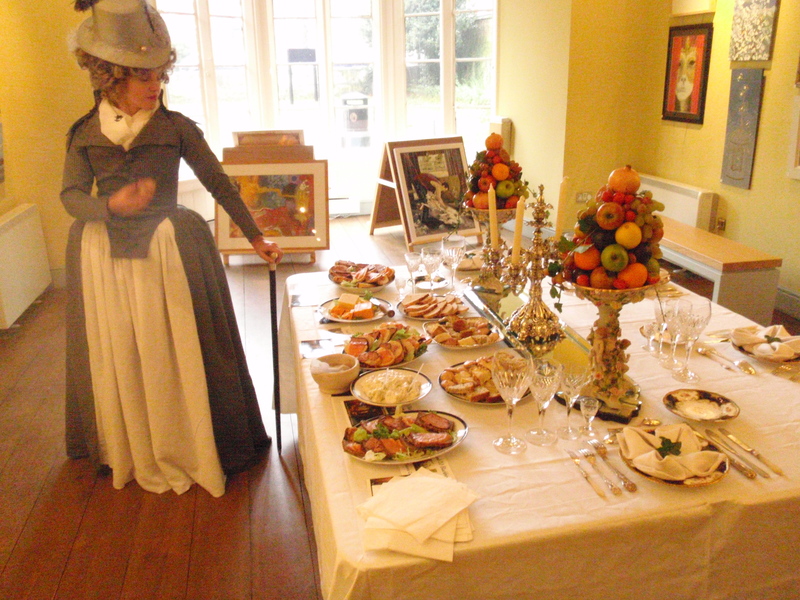 A different room was set up for the feast, all being prepared by a an army of servants in the kitchen, and the laying of the table supervised by a dashing butler. 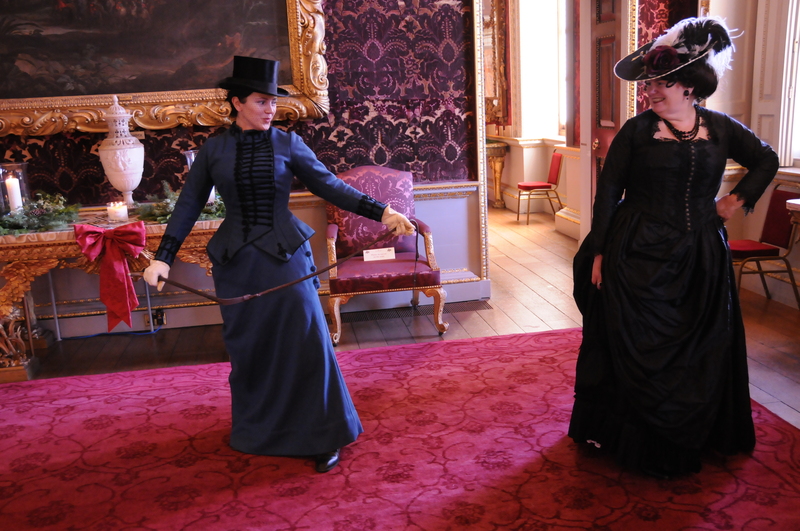 The yard and the museum were alive with entertainment, Victorian market, photographers carriage rides and storytellers – a little paradice for the kids! Inside the little ones could visit The Green Man ( the Victorian Santa!). The entrance was guarded – we all felt extra safe with sucha sentinel! 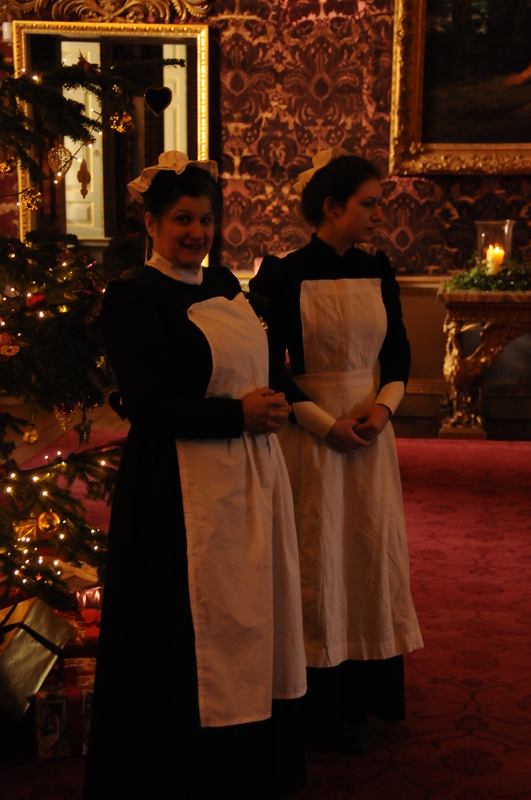 Each room had different interpreters entertaining the public. 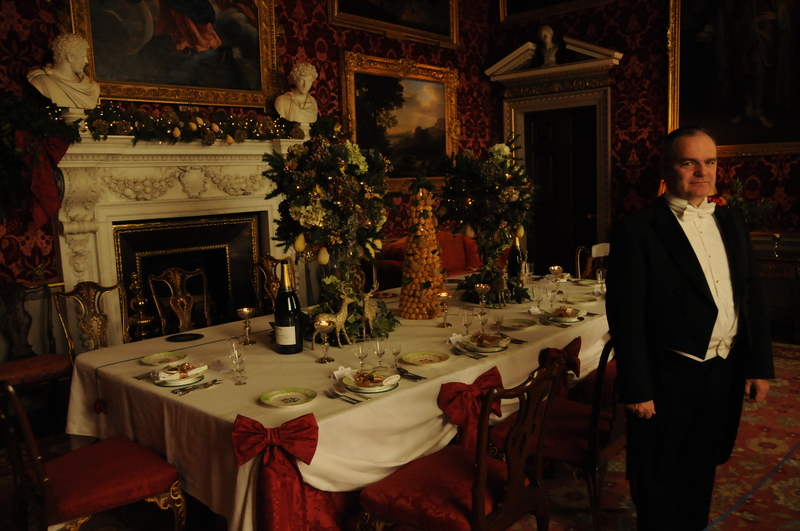 Lucas, Eleanor and I were in the South Dining room; my role was to talk about the secret language of the fan, Victorian ettiquette, manners and customs. 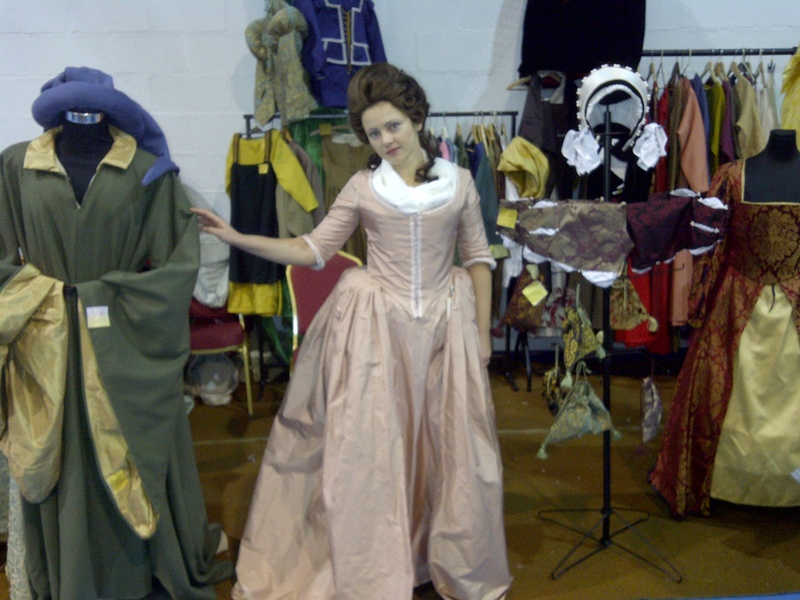 What we did talk about ranged from fans to railways, toys manutacture, corsetry and post cards – absolutely everything, so we had an extremely interesting time – and we talked to over a couple of thousands people each weekend! antique fans at the ready! 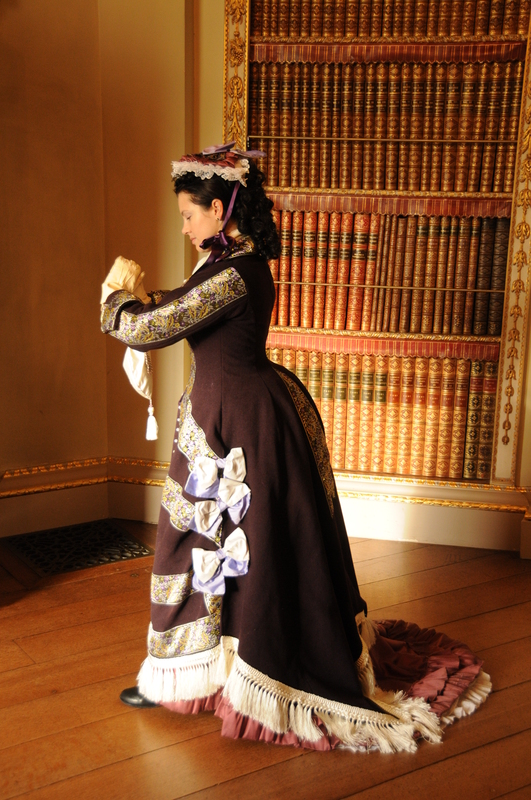 Am very happy at how wellthe welking outfit turned out – called now The grape dress due to the pattern and the colour of the silks. 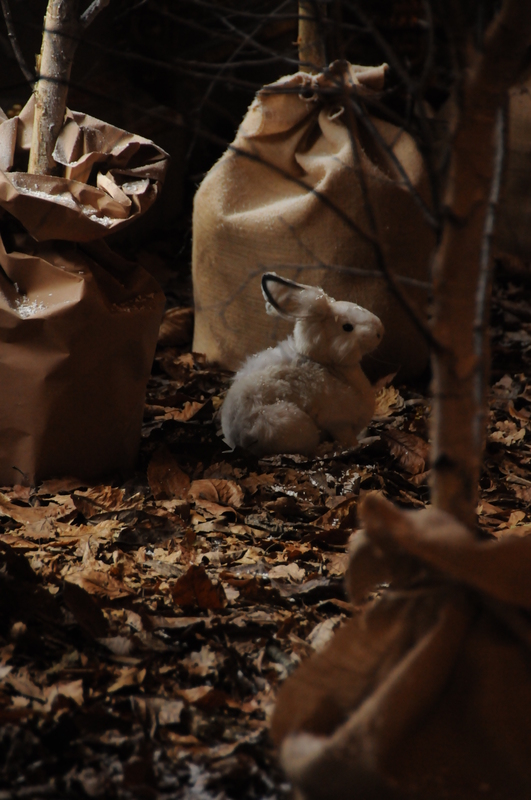 again, more pictures on my page, here. 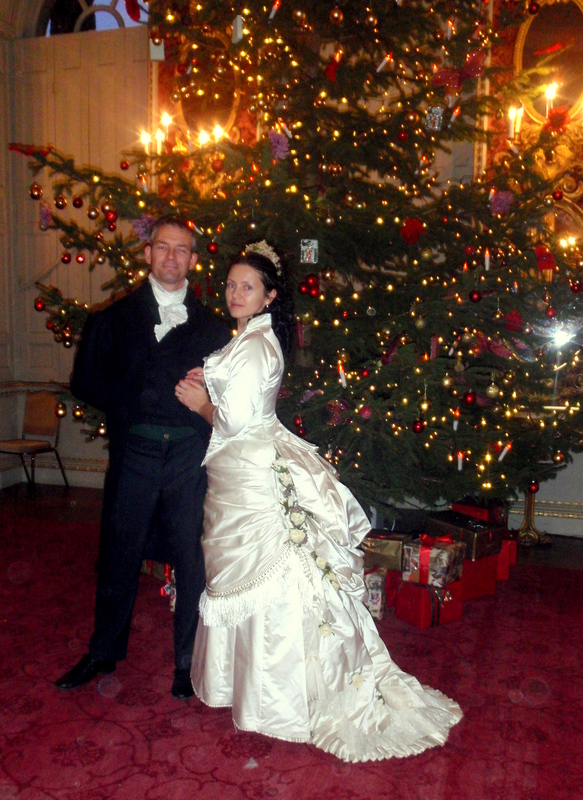 And the good news is – we are back for the Victorian Christmas 2013!!!! 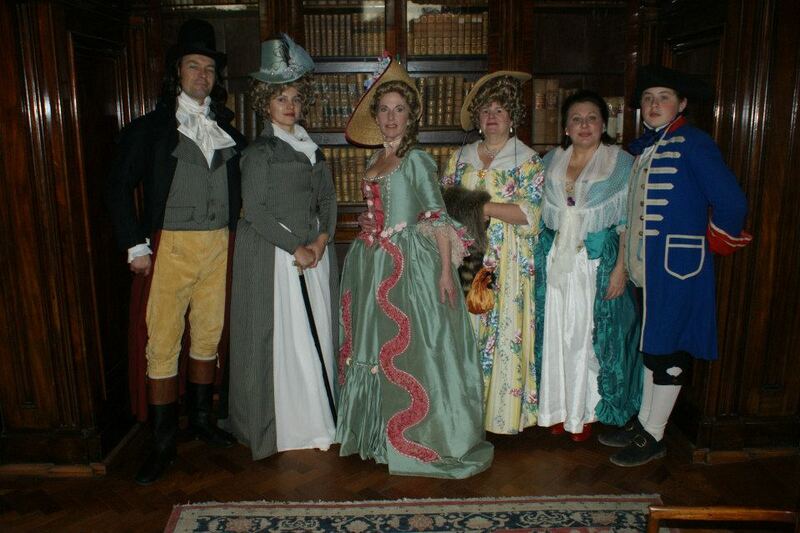 Last autumn we were asked to participate in an 18th century event at Ayscoughfee Hall Museum. it was a fairly generic do, the first of many more to come hopefully, as the place is steeped in history and boasts not only lovely interiors but also rather spectacular gadens. 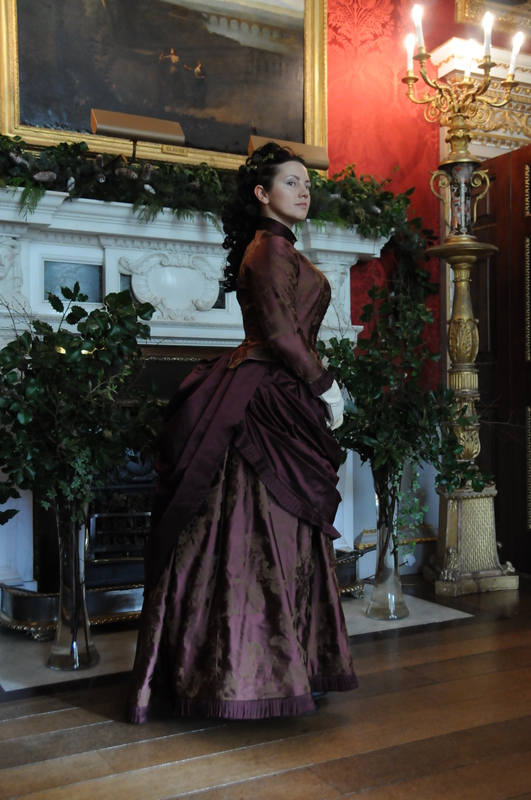 I agreed to provide a few dresses for the display, and, accompanied by my hubby, to interract with the public. 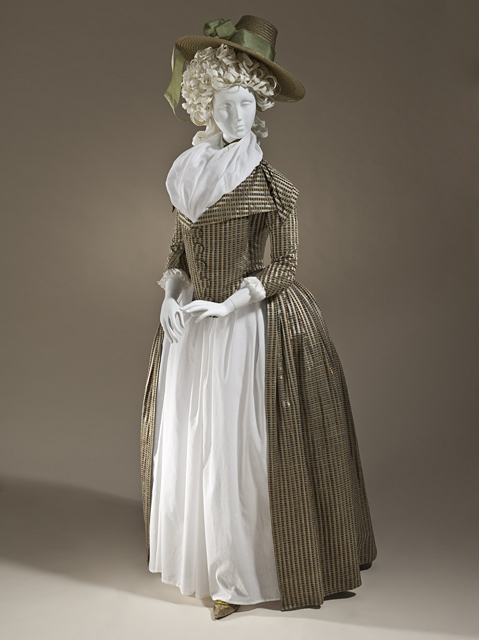 The dresses to go on display were 3 items from 1770-85: a robe anglaise, a polonaise and a riding habit. I had a nice francaise too, but it got sold and now lives with a lovely lady in Paris! 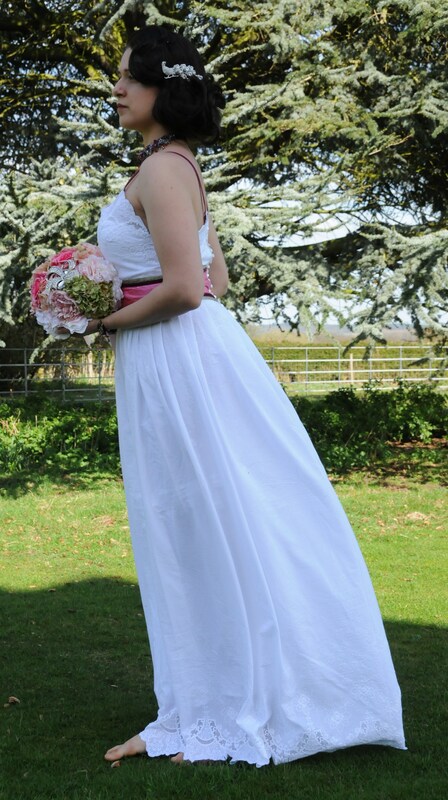 The robe francaise – here at a wedding photoshoot, so excuse the modern hairdo! 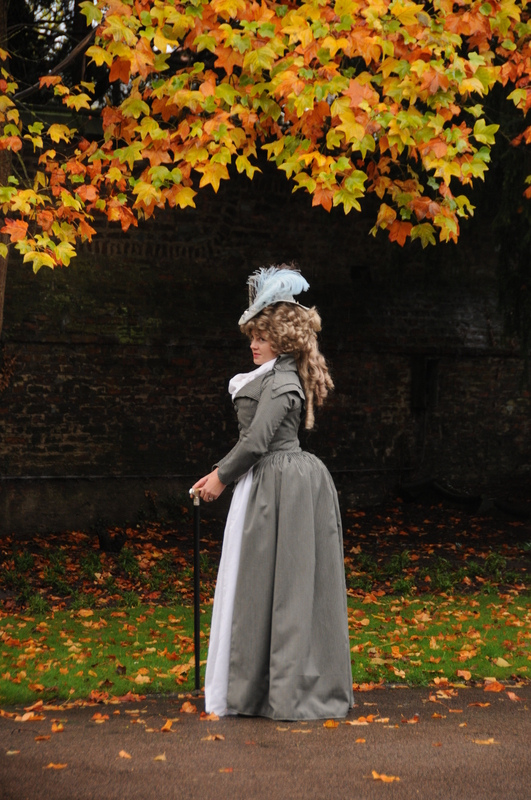 And since Lucas agreed to entertain the visitors with tales of his daring deeds as Scarlet Pimpernel, I became Lady Margueritte Blackney – and the lady needed a travelling outfit suitable for autumnal temperatures and comfortable to wear. It was an easy choice – I have always loved the simple elegance of the redingotes and the one in LACMA has been on my to do list for ages. 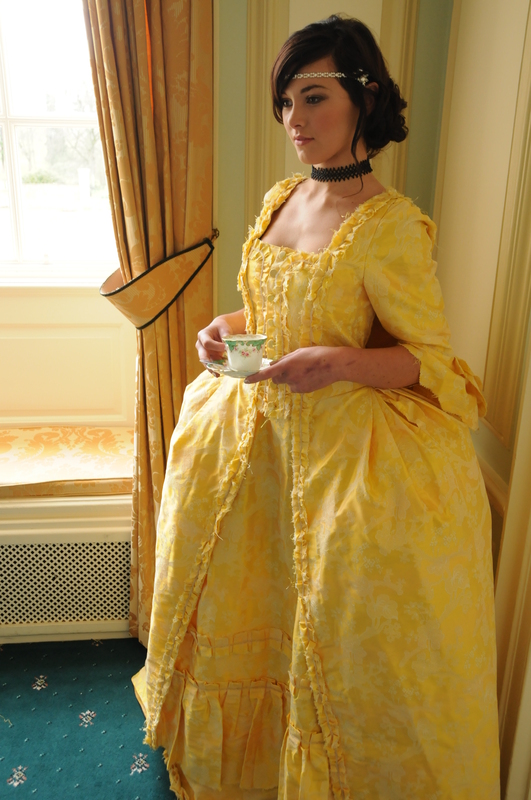 And since it just happened that a suitable fabric was living in my closet for a while, I set to it – I had 2 days to make the redingote and the muslin petticoat, and two days to get my Scarlet Pimpernel a waistcoat and a coat suitable for his role. set and ready to go! 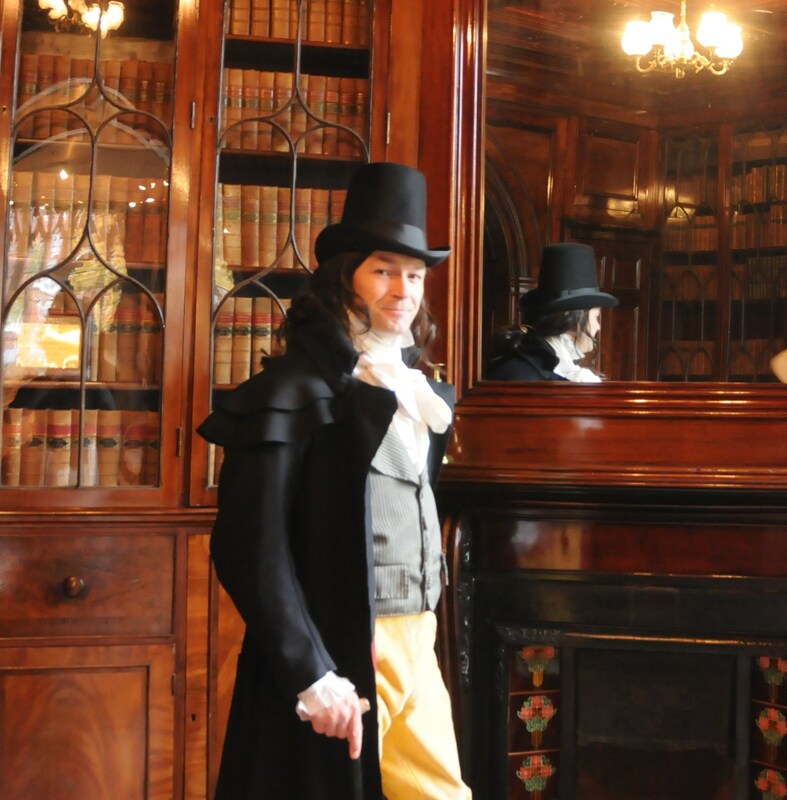 On the day, it was rather brisk – so the travelling outfits were a blessing – even though we were inside. The rest of the team was getting ready; we were joined by lovely Julia Gant and her team from the 4and20blackbirds and Eleanor from The Guild of Historical Interpreters. 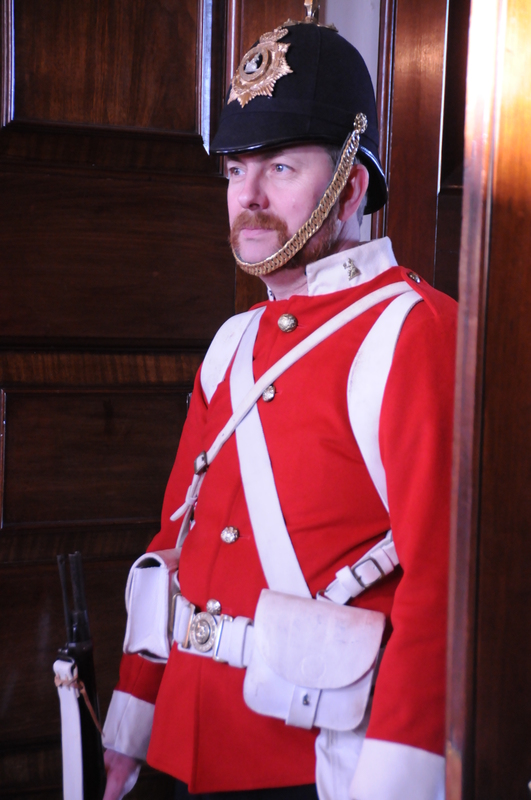 The event was lovely – not crowded, but with lots of interesting people popping by for a chat – and it was a real pleasure to discuss history,its military, social and costuming issues. 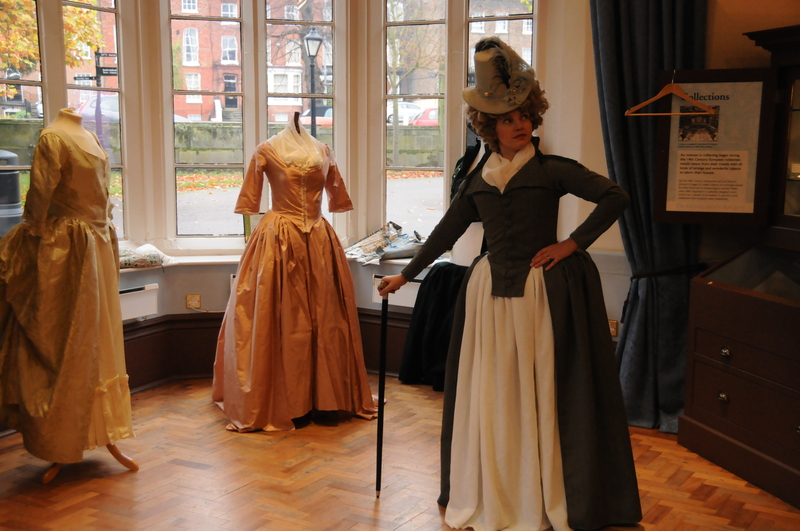 The contrast between our 1790 outfits and the earlier focks on display provided a valued starting point to a discussion to all the social changes the French Revolution brought about. so a very interesting day! In the meantime Eleanor was showing the kids how to decorate fans – and I also had a go at cutting out silhuettes:-). The lunch was a rather yummy affair, beautifully presented and tasted as well as it looked! Altogheter, a great day’s fun, informative and entartaining! and of course, rather pleased with the way the redingote turned out 0 i did amend the front slightly later on, but happy with the first attempt!